The snow is here! And lots of it! Many cyclist wonder, can I ride in the snow? And the answer: of course you can! The important thing to remember about riding in the snow isn’t whether it’s possible—everything is possible. It’s simply a matter of being smart about riding in uncertain weather conditions. Here’s how to make snow riding work for you. The more tread on your tires, the better. You can ride in snow on slicks, but we wouldn’t recommend it. 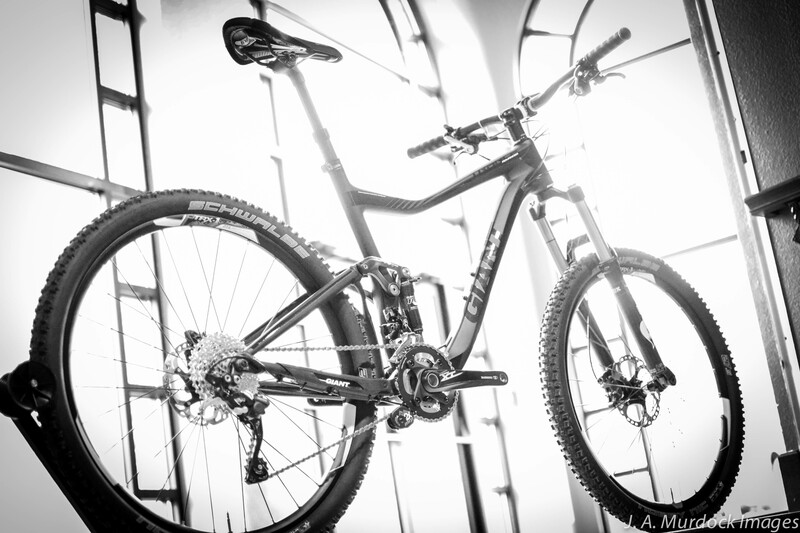 At Peak Cycles Bicycle Shop, we have a large selection of tires for road bikes, mountain bikes, and cyclocross bikes. Stop in and pick up a new set of tires just for your winter cycling adventures. Speaking of tires, let some air out of your them, whatever sort they are. Ride them soft: you’ll get more grip. Focus on a relaxed and responsive riding position. Sure, it’s natural to tense up with icy or snowy conditions, but if you focus on relaxing your hands and arms, while keeping your weight back on the bike, you may find it easier to steer the bike from your hips and less from your upper body. This makes directional changes smoother and easier with your whole mass on the bike, rather than by sudden sharp steering inputs at the handlebars. Don’t be a speed demon! Slow down and enjoy the views! Celebrate the adventure of riding in different weather conditions. A good rule of thumb to remember is to keep your bike in good working order, maintain care of your bike parts and don’t be too ambitious about your speed. All this allows you to truly enjoy the experience. Go fat! 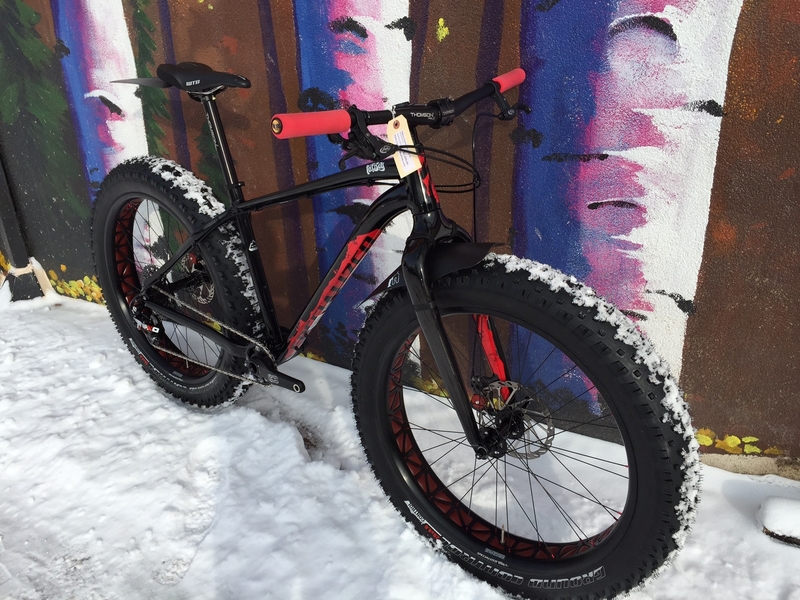 Fat bike that is! Fat bikes are wonderful for riding in the snow. 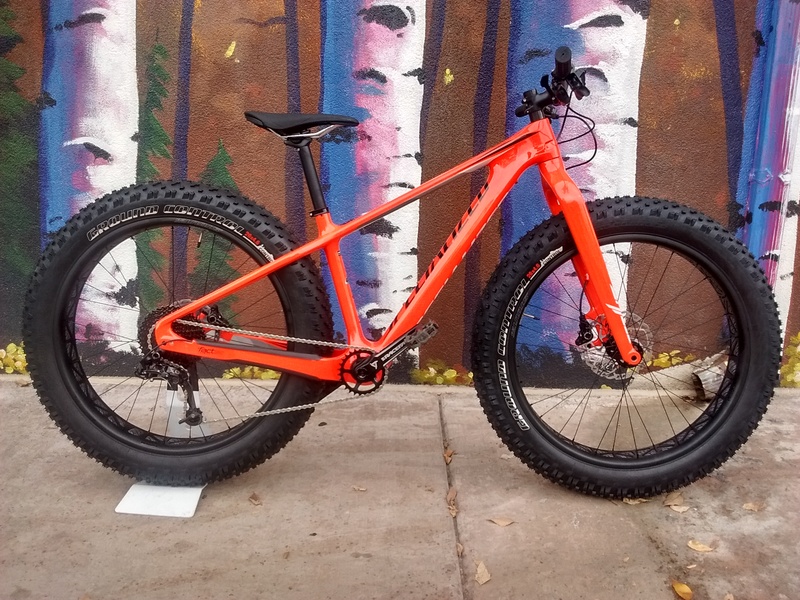 Many fat bike models today are similar to “normal” mountain bikes, which have slacker head tube angles, lower stand-over heights, thru axles, and tapered head tubes. The main difference is the tires. The wider tires have more traction in both dirt and snow. They climb better than almost any mountain bike. If you’re new to fat bikes, you may enjoy reading about some Top Fat Bike FAQ’s or Why Go Fat. Or, stop by the shop and demo a fat bike! Dress for the occasion. Because it’s cold out, it is tempting to overdress. Avoid that temptation! Depending on the type of ride, the duration of your ride, and the elements, your cycling apparel options make the difference between a suffer fest or a great ride. Take an inventory of your cycling clothing and ask yourself, what clothing do you need to wear in different weather conditions? Do you have waterproof and wind resistant clothing? Do you have enough of the basic cycling necessities, as in leggings? Arm warmers? Knee warmers? Scull cap? What about your base layers? Do you have enough of them or do you need to add in some fleece lined clothing? Lucky for you, at Peak Cycles Bicycle Shop, we can help you with all of your cycling apparel needs! In fact, we’ve got quite a lot of new cycling clothing in store right now! Or, check out our How to Dress for Winter Cycling –Video for ideas dressing warmly for your winter rides. Your experience will correlate directly to your level of preparation. It’s true, winter riding requires more diligence and commitment; but the flip side is a sense of wonder and adventure that accompanies the wintertime cycling scene. It’s winter. It’s cold. There’s snow on the ground. And, when the snow melts, it’s still cold – and wet. Many brave winter cycling and enjoy it with layering and a designated winter bike to ride. But, most of us suffer inside. The first few weeks of indoor training seems to be bearable; however, as the weeks continue without any hopes of prolonged outdoor riding in sight, the indoor workouts get shorter. Or, they don’t happen at all. The problem is, consistency in training is critical to prepare your body for the physical stresses of the season ahead. How do you make peace with indoor training? How can indoor training actually support consistency in training? It may seem obvious, but scheduling workouts on the same day every week will help with consistency. By creating a repeating schedule that you know works for you you minimize the chances to missing a workout. The post, 4 Habits to Increase Your Consistency, offers more suggestions on increasing consistency, such as, being purposeful, following your plan as best as possible, and getting in shorter rides when you have less time to train. But motivation is key to maintaining consistency. When lack of training motivation rears its ugly head, you don’t have to be a victim to it, take action. The post, Surviving the Winter as a Cyclist, shares some great “fortune cookie wisdom” in that the hardest part is just getting started. “Whether it’s starting your workout for the day, or jumping back into training after you’ve been “off the wagon” for a while, getting going is tough. That’s the law of inertia. An object at rest wants to stay at rest. But on the flip side, once an object is in motion, it wants to stay in motion. The key here – start pedaling. Make a time commitment to stay on the bike for 30 minutes to see how you feel. By then, most likely you’ll be into the ride and lack of motivation is disappearing. If cycling indoors just isn’t your thing, accept it. But don’t give up! Trade saddle time for gym time to gain core strength. The primary focus when it comes to strength exercises for cyclists is to train in a similar motion to cycling with lower and upper body, while increasing overall core strength and muscular endurance. Check out The Best Strength Exercises for Cyclists or 7 Hip and Core Exercises for Endurance Athletes to get you started and also, to keep you motivated through the winter months. You may also consider doing yoga. In cycling, the quadriceps, hamstrings, and hips never rest. As a result, riders often have overdeveloped quadriceps and tight hamstrings, which can pull the hips out of alignment. Also, a cyclist’s spine is constantly flexed forward. If proper form isn’t maintained, it can result in muscle pain and strain in the back and shoulders. Yoga helps ease the tightness, creating core strength, and aligning the spine. Even if you aren’t into yoga, there are 3 poses you should practice. When you think about it, indoor training doesn’t have to be as bad as you think. Options are available. And, you may just give winter riding another chance too! Winter riding can be equally as fun as Summer riding given you have the right cycling apparel, you know how to dress for winter riding, and you have the right bike parts in your winter toolkit.